Secondhand Rose, 1989: Bella, age 22, still loving her secondhand stripes. The style: thrift store chic. And, I was there. The FIRST time. WARNING: The following is a major FASHION FLASHBACK- attached with memories and proof of having survived the late '80s, and early 1990s. The place: Sacramento, California, smack dab in the middle of a roughed up patch of paradise we called Midtown. I lived and breathed up this universe; my friends were fierce, friendly and creative sorts, many of whom, I'm lucky to re-connect with via Facebook (thanks, Facebook!) which is where I got these photos. We rode our bikes everywhere. Hit every yard sale, garage sale and thrift shop on the way. We sipped pints in pub/dives/coffee shops named Blue Ribbon, Malarkey's, the Weatherstone; drinking like fishes, laughing like hyenas. There were some very good times, with some very amazing and special people. I always felt my girlfriends were the prettiest girls on the planet. And I tended to surround myself with the most clever and handsomest of men. Creative, cool and interesting, even to this day, I've yet to match the adventures of that decade. In fact, some of my all-time favorite people are folks I met + hung with in the 1990s, so bless 'em. Those were good times with good peeps. A special thanks to T. Aidan for sharing the photos, and for all the lovelies in my life, past, present and future who boost me with their spoken love and confidence. Where were you in the 1990s? How did that fin de siècle decade impact + color you? You're so damn adorable! You actually look just the same now, bella Bella. You had style in bucketsfull. I feel like I'm still learning how to have style. 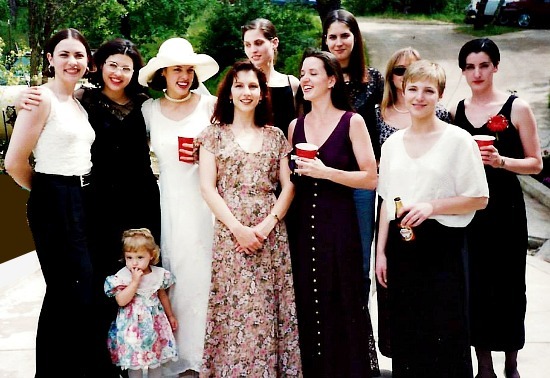 My '90s were completely split - half in Seattle with cool friends, half in the north of England trying to learn a new culture, new work, how to be a wife and stepmom. Crazy! Totally agree with both Val and jKelly you look amazing and adorable both then and now. Looks like you guys had a great time. The 90's saw me meet the love of my life, get married and have my youngest daughter as well as change my job. It was definitely a busy time for me. You're such a beauty, then and now! Wonderful pictures, and I see the joy in your face. The 90's were good for me too: met Sandy, went to grad school, made memories. I agree with Patti, you are such a beauty, then and now. Beautiful Bella, then and now! The 90's had me starting and finishing my teaching career and moving to the West Coast. I wish I had discovered the wonders of Second-hand First style then. Those were some lean years! Oh well, better late than never. Thanks for being your-ever inspiring self! Really cool seeing your pictures. You look great. Happy Birthday Bella! In 90s, which I loved, despite the fact it was some hard times in my country, I lived in Russia and studied at the university. I studied languages and literature (English was NOT one of the languages I studied - I am self taught here, so forgive my my silly mistakes). I LOOOOVED those times, still remember them with great fondness. Great friendships, falling in love mostly unrequired), books, museums, theaters, music... everything! By the graduation I felt like I had wings to fly. I still have them which is partly the result of those amazing years. Happy birthday, even if it's a bit late, you are such a talent and INSPIRATION, dear dear Bella! All the best to you!!! It seems you have just always been adorable and cute! 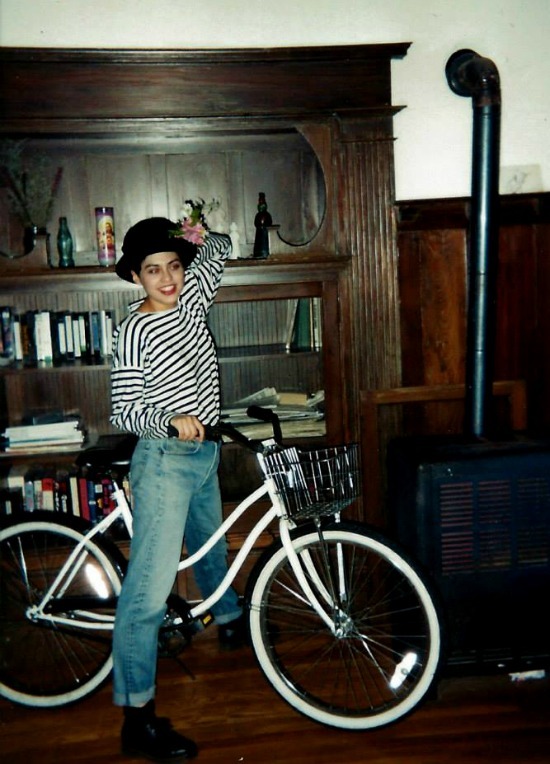 I love the photo with the bicycle. I love the bicycle! Well I did my best with a 90s look and linked up. I spent most of the 90s just being a mum and not thinking too much about my clothes or even being aware of what was in style. Happy Happy Birthday!! So wonderful to reminisce the days! I see some touches of Madonna in your photos. I hope you get to celebrate your birthday with loved ones and friends! Beautiful Bella of the 90's loved these flashbacks! Happy 49th you gorgeous girl! I am still friends with one person from college but that's it. So what's the name of the potion you drank because you look exactly the same. In your next post can you recreate the pool table photo? HOT! Oh gosh what fun photos!! You rebel you. I can see the fun you had from these pictures. You were there, you have had this. Treasured memories. You are ADORBS! I wish I was as cute as you in the 90s. Sheesh, don't I feel young?! I was only 4 when you were 22!! You look exactly the same chica! Beautiful then! Beautiful now! Some things never change. Thanks for hosting Secondhand First. Oh, man, SO 90s! I wore so many of those looks too! Thank you for the link-up! 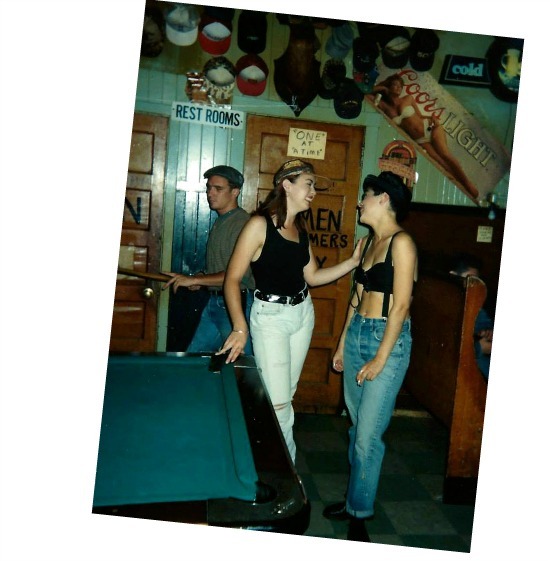 I love the photo of you on the pool table - you were, and are, a sassy, smokin' dame. 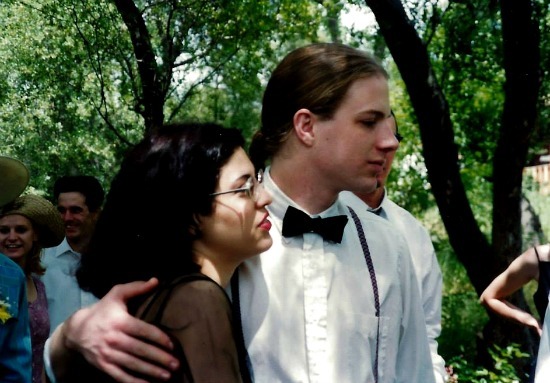 I don't really remember what I was wearing in the 90's - I was in my 30's and it was a stressful, strange decade for me.